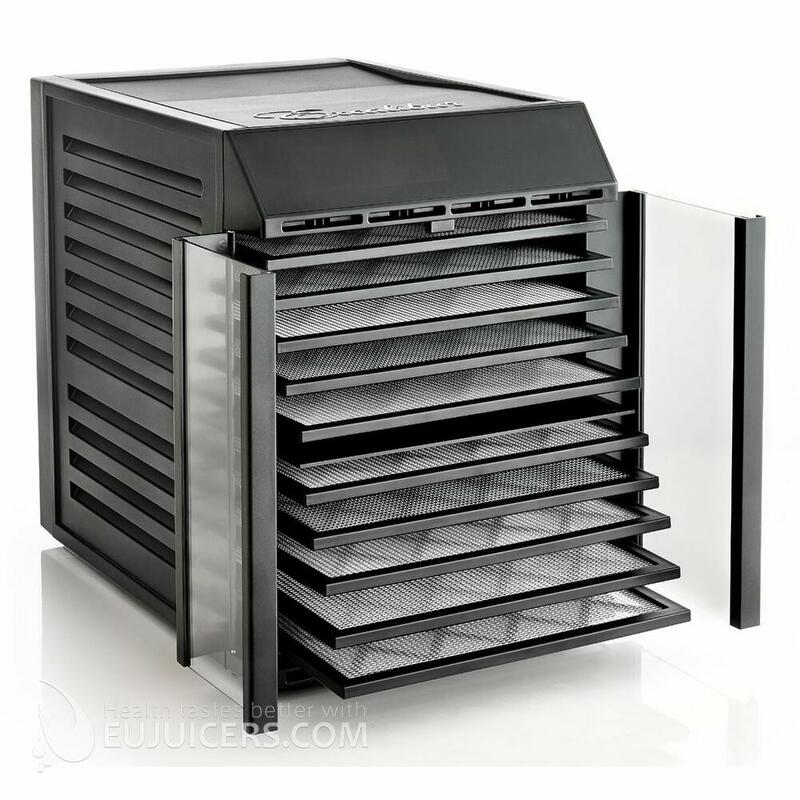 Excalibur finally comes to the market with a dehydrator that is kitchen-friendly. All previous Excaliburs are big square boxes which tend to be wide and take up a lot of space on a kitchen counter. In contrast, the RES10 is taller and slimmer than their boxy models. It fits much better on a kitchen counter, and with its digital control panel on the front of the unit, could even be mounted under a cabinet. The dehydrator looks much bigger in pictures - in real life it is very compact. 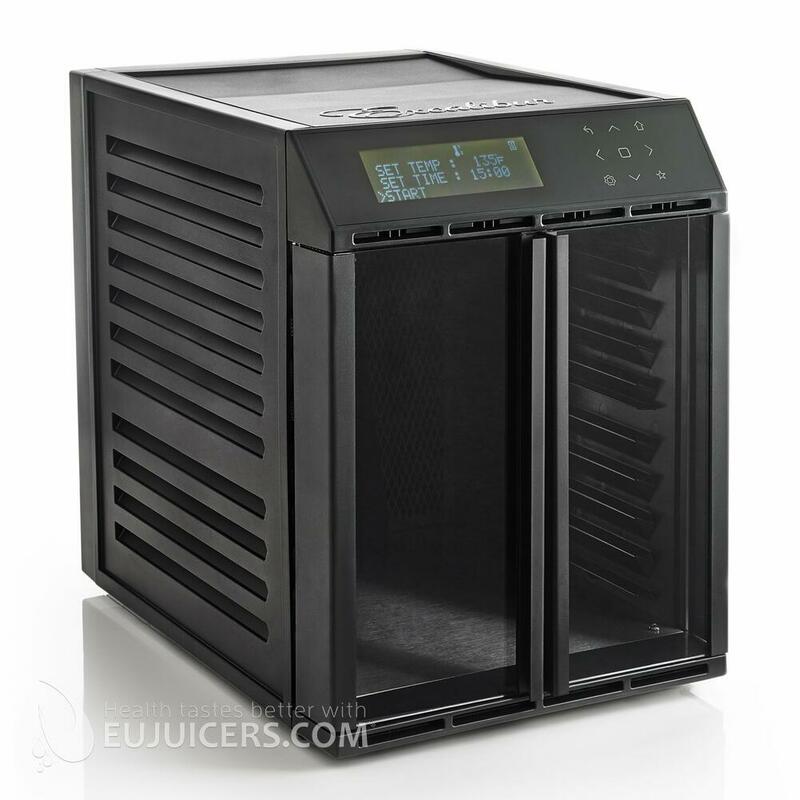 The downside is that even with 10 trays, the drying capacity of the RES10 isn't much more than their standard 5-tray models. We would have preferred glass doors to the clear plastic doors here, but otherwise the design is functional and quite attractive. The Excalibur RES10 is the first Excalibur model to use their new digital interface. The interface here is easy to use once you've tried it, although it isn't a true touchscreen. It's definitely a step forward from their previous digital models. Upon turning on the unit, there are two choices: "Dry It" and "My Recipes". "Dry It" lets you enter the time and the temperature you want and start it, while "My Recipes" lets you name and program up to 30 recipes. It's not as simple to use as their models with analog dials for time and temperature, but it is much more flexible. A very interesting feature is that the RES10 has two independent fans and heating units for the top and bottom half of the dehydrator. There is a divider that can be inserted which in effect divides it into two separate units. Each half can be individually set to different times and temperatures. Also, it can be set with two stages of drying. For example, it can be set for beef jerky at a higher temperature for a short time followed by a long period of time at a lower temperature. The tall form factor has the advantage of giving a lot of vertical space, which is handy for things like jam, yogurt, or infusing oils. The RES10 performed flawlessly, like most Exalibur models. We tried the dual-zone feature by drying pineapples and apples at the same time, something we wouldn't normally do since pineapples have a much higher moisture content. 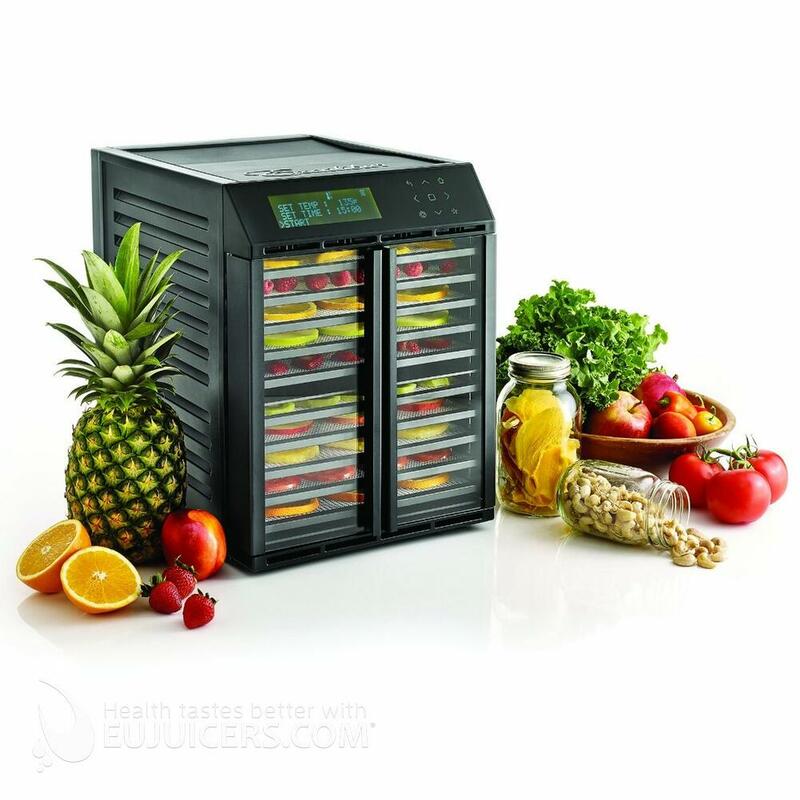 We set the pineapples in "Zone A" (the top half of the dehydrator) for 10 hours at 56C, and put the apples in "Zone B" (the bottom half) for 6 hours at 50C. They both turned out well, with the pineapples being ravenously consumed by our office staff. The dual fans and heating units were also useful when doing one ingredient at a time, as they provided a more even coverage of airflow compared to one larger fan located in the middle. We were also pleased to see Excalibur now making a model that can go down to 29C. Previous models had a minimum temperature of 35C. 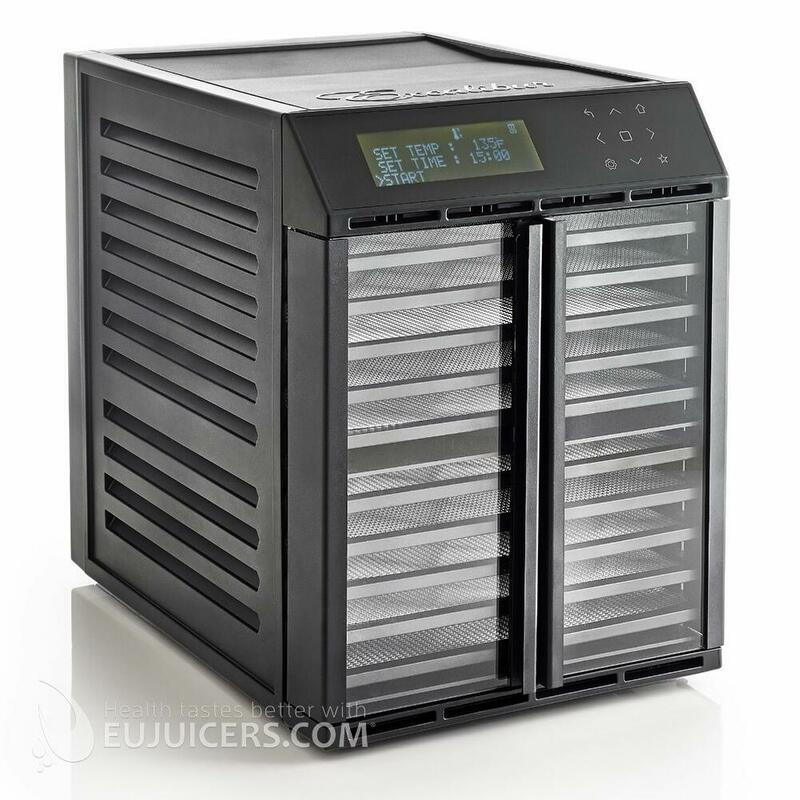 We really like Excalibur's new RES10 dehydrator. The design, interface, flexibility, and heating uniformity are outstanding. 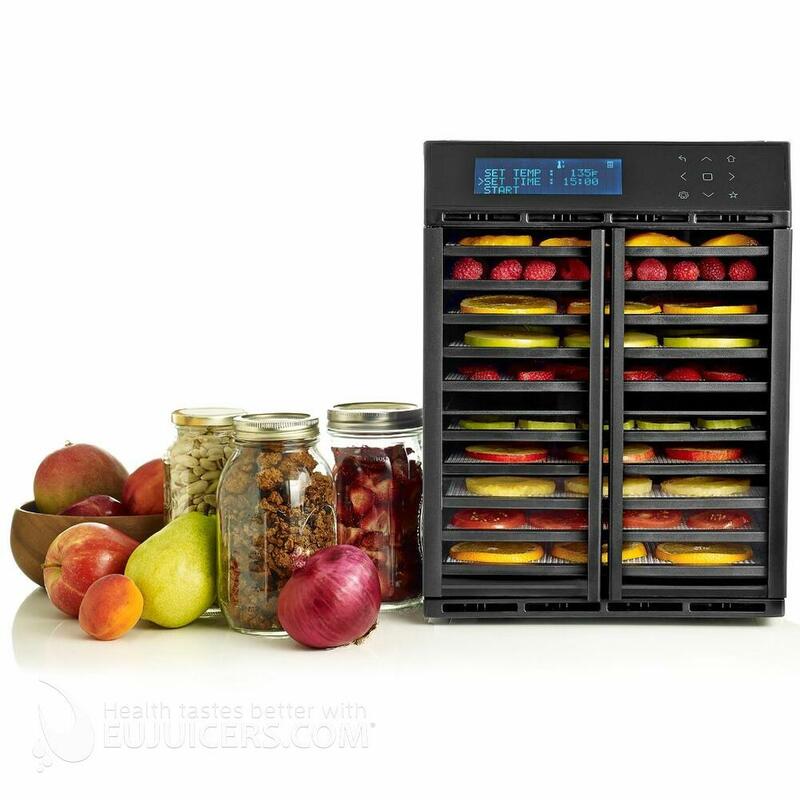 Overall we think it is well-suited to individuals who dehydrate a wide variety of things, and would find the dual-zone feature helpful. It's also great for someone who wants to keep it in their kitchen as it looks great, operates quietly, and doesn't take up much space. Just keep in mind the rather low total capacity.